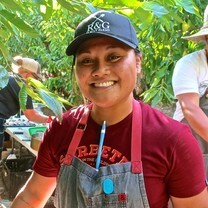 Danica Aviles is a co-proprietor of the San Francisco-based pop-up restaurant called Pinoy Heritage specializing in contemporary, Filipino-inspired cuisine. "My other dinner date...Korean BBQ then ice cream 🍨 They grow up too fast 💨"
"To Chef David for making Caleb’s birthday dinner a special one!!! He loved his longganisa and rice 😍 🍚"
"Smoked coconut I cream, passion fruit espuma, cashew crumble, burnt coconut powder #pinoyheritage"
"The after math...our off menu dish at diankris"
"Longganisa "tsukune" | sugar cane, egg yolk"
"Crispy empanada | chorizo, chicories, egg yolk, pear pinakurat"